After his visits to Arquà in 1813 and 1818 (see my previous post here), Lord Byron returned to this beautiful village a fourth time, even though he didn’t write about this in his letters and journals. 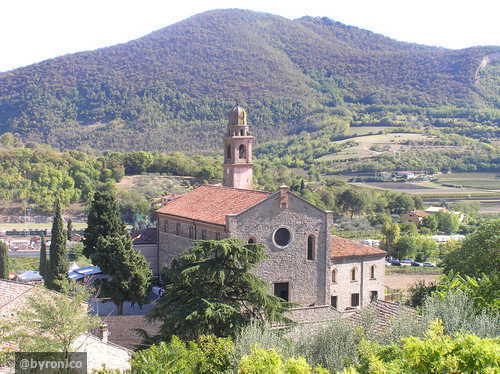 His last visit was in fact described by his mistress, Teresa Guiccioli, in Vie de Lord Byron en Italie (there are different versions of this book), where she recounted their itinerary through the lanes of the village, as well as their homage to Petrarch’s House and mausoleum. 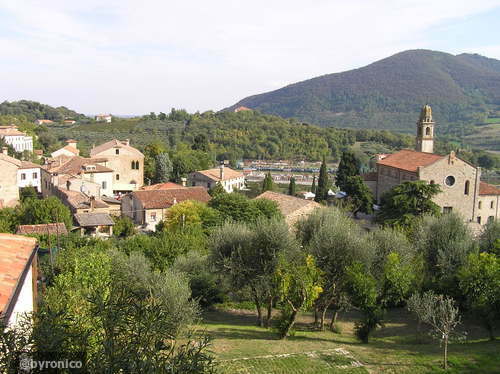 Teresa passionately wrote her memories, remembering how Byron admired the landscape, the view to the long plain and the plantations surrounding the Euganean Hills. 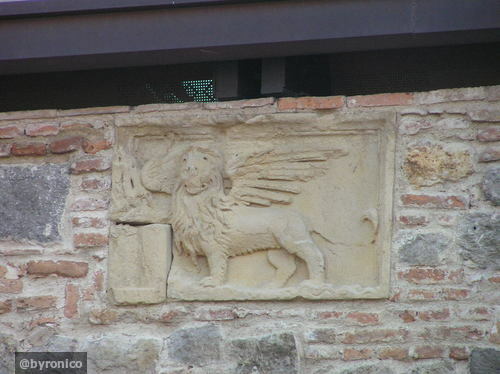 It was in September 1819, on their way back to Venice from Ravenna, that the two decided to diverge to Arquà. Teresa’s description is really moving and the tone hides a nostalgic memory of the happy moments spent with “her” Lord Byron. In fact, on the attempt of trying to recall her mood at the time, she uses words such as “serenity”, “sweetness” and “splendour”, that don’t merely depict the qualities of a beautiful day, but also show her emotions, which persisted in her heart even after many years. It was a beautiful, sunny day, so beautiful that it was beyond description and that “cannot be imagined unless seen”, where the sky was made of “opals and sapphires”. 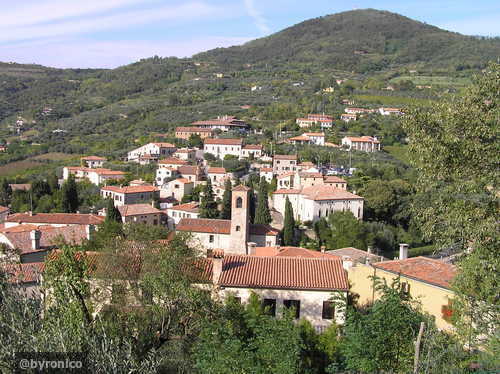 In this heart-warming atmosphere and caressed by the sun, the two climbed the hill heading towards Petrarch’s house, walking through vines, pomegranate trees and shrubs. For Teresa, it was literally a “heartly paradise”, a paradise like the one dreamt by Dante. Surrounded by nature, Byron was bewitched by the marvellous view, like only a “lofty soul” like his could be. 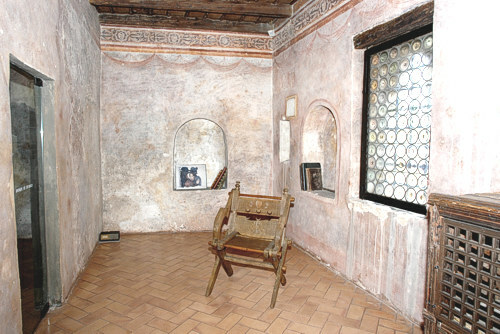 We know that he didn’t like Petrarch, but Teresa loved his poetry so much that she wanted to recite some of Petrarch’s verses while they paid homage to his tomb. 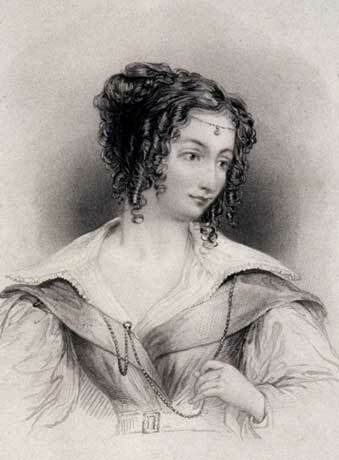 Byron was not attracted by platonic love poetry, one of the main themes of the Italian poet, but, showing respect to her mistress, he revered the tomb in religious silence. In fact, Byron was instead fonder of Dante, like Foscolo. Teresa reveals that Byron didn’t want to “destroy any pleasurable illusions” and enjoyed listening to her reciting Petrarch’s verses. 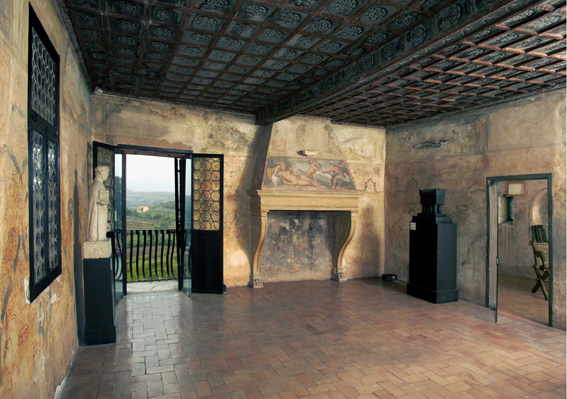 After seeing the tomb, they moved to Petrarch’s house, further up the hill, where Byron complained once again (as he had done on previous visits) about the painful state in which the great poet’s house was kept. Actually, can this be a proof of the fact that the house even though restored was actually carelessly managed? If so, this may have caused the misunderstanding of a run down building (as I said here), while in reality the house was merely uncared for. Once in Petrarch’s modest abode, Lord Byron expressed his astonishment at seeing how the ground floor of the house was strewn with sweepings of corn, and how it became a storeroom for worn utensils. Therefore, the place was clearly untidy and in a state of decay, partially in ruin. 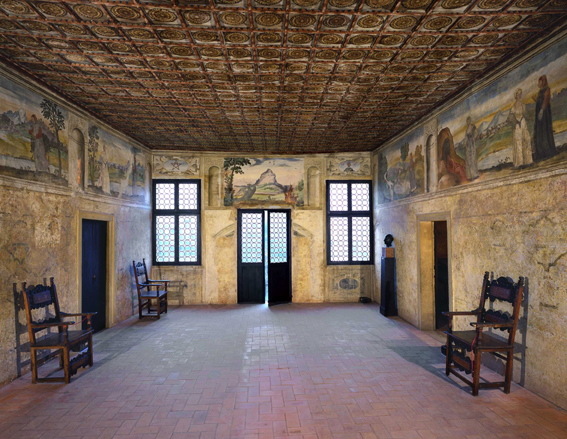 Afterwards, they moved to the upper floor, where they admired the frescos that Petrarch himself arranged to be painted. The main theme of the seven scenes was inspired by canzone no. 23 of Petrarch’s Canzoniere, by the title Nel dolce tempo della prima etade (In the Sweet Time of the First Age), also known as Canzone delle metamorfosi (Song of Metamorphoses), where the main character is Laura, the object of Petrarch’s platonic love. Then they saw the room where the visitors’ book was kept, and Lord Byron told Teresa that even though his autograph was already there (he signed the book during the 1817 visit), he wished to sign it again and put his signature next to hers. Teresa signed “with feeling”, then handed the pen to Byron who wrote his name beside hers, expressing the wish that their names will remain there forever, never to be parted again. 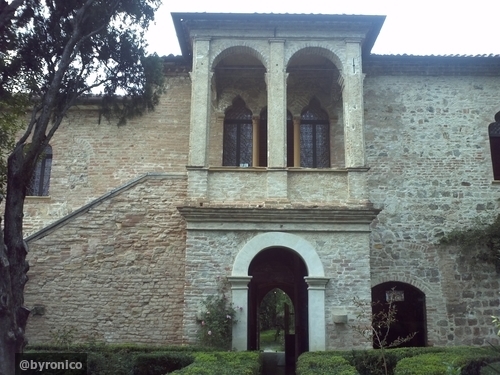 Unfortunately, the guest book of the house has been brought to the civic library in Padua in order to preserve it, as light and humidity were causing damage, so visitors cannot see it in the house anymore. I had the privilege of seeing Lord Byron’s autograph in 2004, even though I couldn’t take any pictures. I don’t remember if Teresa’s autograph was beside his, so I don’t know if the one I saw was from the previous visit or from the last one. Teresa’s account continues depicting how Byron stayed looking out of the window, admiring the forests in the horizon (that unfortunately now have been replaced by horrible factories and houses without a soul). He “tarried for some moments by that window, absorbed in his thoughts”, then they went together into the garden where they had some grapes and Byron said that he had never had such delicious fruit. At the end of the visit, they walked together again to Petrarch’s memorial in the main square of the village. 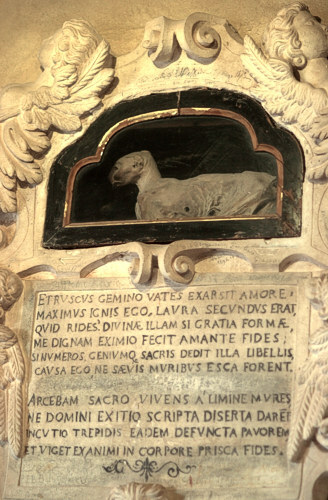 There they saw children playing around the monument, and Countess Teresa Guiccioli writes that there was nothing mournful in the sarcophagus, which was instead surrounded by a feeling of eternity and blessedness. Lord Byron asked the Countess which sonnet from Petrarch’s Canzoniere was her favourite, at which she replied that it was “Petrarch’s dream” and declaimed it to Byron who, knowing Italian like a native, felt moved by the verses. Then they drank water from the fountain and walked to their carriages, on their way back to Venice. Another interesting description of Arquà (apart from those I’ve already mentioned in the previous article) can also be found in The Last Letters of Jacopo Ortis, where there is an account of the visit that Jacopo, the protagonist of Ugo Foscolo’s epistolary novel, made to Arquà together with his beloved Teresa. In spite of a similar mood in the description, Foscolo’s novel was written before Teresa Guiccioli’s account, so hers can’t be considered a source for Jacopo Ortis. Letters from the Exile by Massimo Vangelista is licensed under a Creative Commons Attribution-NonCommercial-NoDerivatives 4.0 International License. Based on a work at byronico.com. Permissions beyond the scope of this license may be available at byronico.com. Thanks for sharing this outing Byron took with Teresa. It’s nice to read about the quieter moments in his life because it seems to color in the parts of him that are not often exposed. The everyday kind of moments. Lovely pictures! Teresa’s account really shows another Byron. Glad that you liked the post and thank you for your comment!